Theory and simulations, assisted by clever experimental techniques, have allowed for an increased detailed mechanistic understanding of biological systems, at the molecular level. This understanding has resulted in a myriad of methods for detection of biomolecules that play significant roles in drug discovery and targeting, microbial and virus detection, gene therapy, and other processes in biotechnology. The applications are countless in fields such as health care, agri-food, and environmental technology. Biosensors are key components of the analytical techniques for detection and measurement of biomolecules. 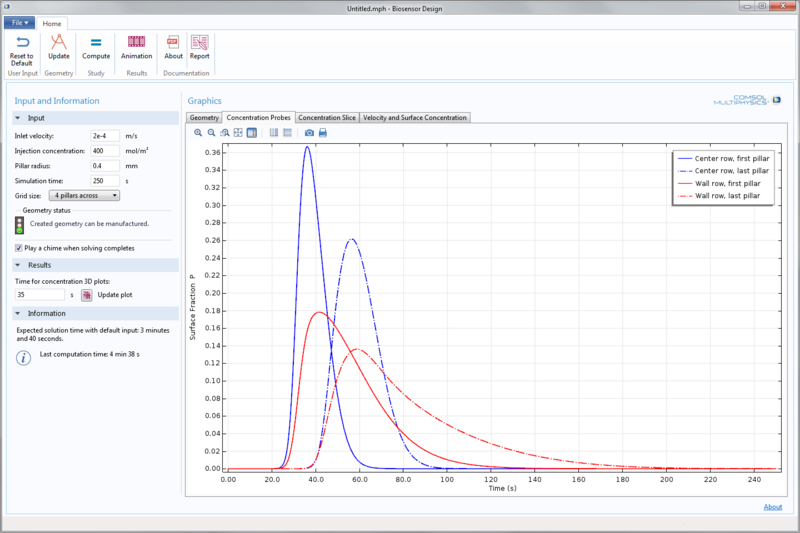 The Biosensor Design demo app, included in the latest version of COMSOL Multiphysics, predicts the results from measurements of a biomolecule’s concentration (or activity) from an understanding of this molecule’s attachment to an enzyme. The simulation app can be used as an example of how to optimize the design of the detector in order to achieve a well-defined signal. The figure below shows one possible arrangement of detector micropillars in a biosensor subjected to an analyte flow from left to right. The gold-colored concave parts of the pillars are coated with an enzyme that can only attach to a specific group of biomolecules. Micro flow cell with pillars coated with enzymes, designed to detect a specific biomolecule. The biomolecules are adsorbed to the enzyme-coated pillars, where they can be measured by, for example, fluorescent detection. Enzymes serve as excellent receptors, since they can only attach to one biomolecule or to a very specific group of biomolecules. A second reaction quenches the adsorbed biomolecule, decreasing fluorescence and so weakening the signal from the detector. The measured biomolecules are contained in a solution that flows over the detector surface (1). The biomolecules attach to the enzyme-coated surface, causing excitation and fluorescence (2). A quenching molecule is also contained in the solution (3) and this can react with the biomolecule attached to the enzyme (4). The quenched molecules no longer emit light and can therefore not be detected. The app’s UI is very easy to use. A few relevant input fields and command buttons are available together with the most important output. 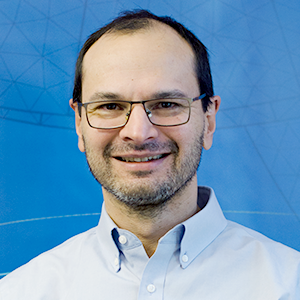 There is minimal hassle when defining the simulation and you do not have to be an expert in simulations to benefit from accurate multiphysics modeling, by gaining understanding, and optimizing your biosensor system. The embedded model defines and solves the fluid flow equations and the equations for transport and reaction of biomolecules, including the kinetics for the surface reactions. 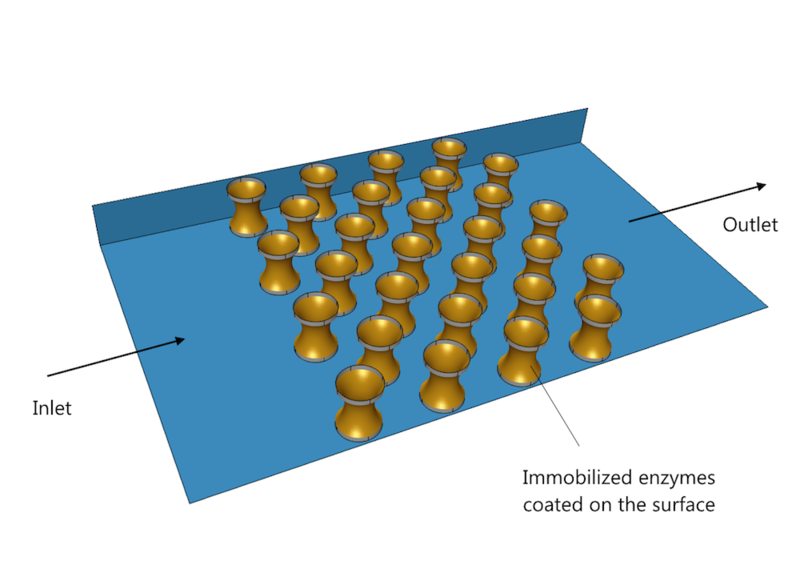 The animation below shows the time-dependent concentration field of the measured biomolecules as a 3D surface (where the height and color of the surface indicates concentration), after injection of the analyte. Animation showing the concentration field of a biomolecule in the analyte sweeping over the pillars like a wave. The color legend and height of the wave represent concentration in mol/m3. The sweeping wave of biomolecules caused by the injection of analyte is also seen on the concentration at the surface of the pillars, as you can see in the app screenshot below. The blue solid line shows the concentration in the first row of pillars and in the middle of the channel. The blue dash-dotted line shows the detected concentration at the surface of the pillars in the back row in the middle of the channel. The red solid curve represents the concentration of the biomolecule at the surface of the pillars positioned in the first row close to the wall of the cell. The red dash-dotted line shows the concentration measured by the pillars in the back row but close to the wall of the cell. The pillars close to the walls and at the back of the cell both contribute to a broadening of the signal from the biosensor. In this case, it may be a good idea to decrease the number of pillars at the cost of a weaker but more well-defined signal. 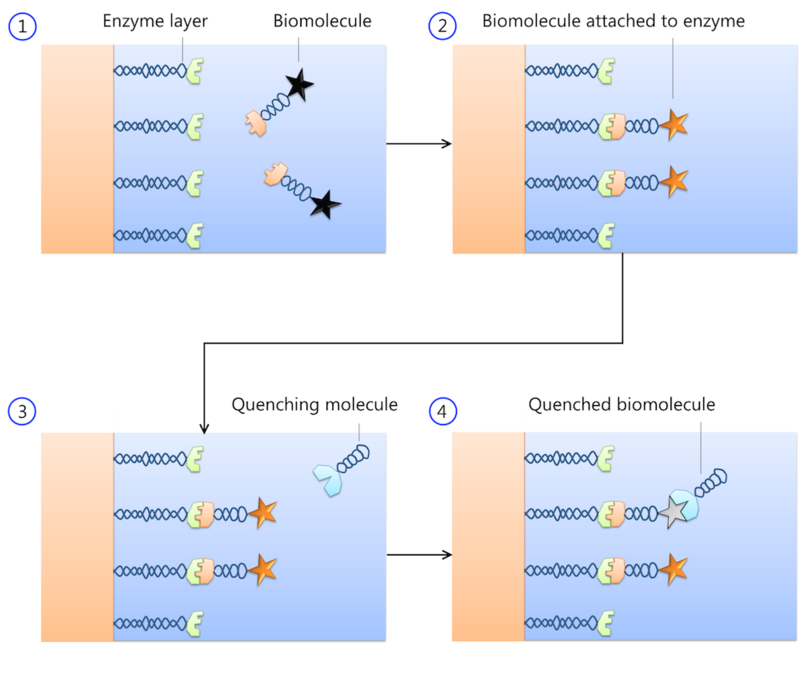 Concentration of the measured biomolecule at the surface of the enzyme-coated pillars at different positions in the cell. The app demonstrated here is one example of countless possible biosensor design configurations. This specific configuration may not be optimal for your purposes, but the app can be broadly used by you to build similar apps with clear and simple interfaces that inspire users to simulate and improve the design of biosensors. Sir, in this design, only the upper adsorptive layer is simulated which is used for detection. But, if we want to design the whole biosensor like magnetic biosensors, in that case, will it be possible to couple this model as with magnetostatics to reflect the changes after detection? 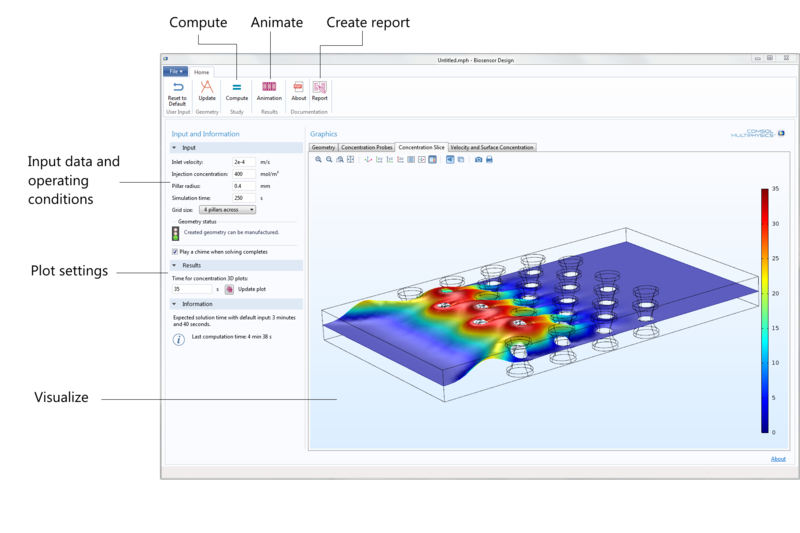 Or Can you please suggest me the modules of COMSOL to design the magnetic biosensors?